Mariposa's Tales Turns 4 Years! It was four years ago when I got bored and decided to start blogging. My full intention then was to do an anonymous blog. Most of my early writings for those who've read it showed the writer in me. It also showed the other side of me. The side where I get pissed...hurt...and more importantly the fun crazy side of me. It took me about 2 years to decide to open up and interact with other bloggers. I'd say it's one of the best thing I did. I've met so many wonderful people and I can say that while our interactions were all online I consider all of you as my friends. Today I'd like to thank you all for welcoming me into you lives. Thank you for all the support you've given me all these years. And more than importantly for sharing your life with me. This site is such a part of me that I can't imagine losing it. I know I've been absent lately but yet despite my very busy schedule I still try to make it a point to come here. I owe you guys a visit, I know that and I'm going to make sure I get to start my rounds this week. I missed you all so badly. Serious! He told me to just get some professional help, like some photo scanning service. He told me that services like this can take care of the photo scanning themselves and more importantly they're done right and photos will be of quality will they are converted to digital formats.More than that they not only convert photos into digital formats but they also offer it for videos and even materials as raw as films! So that is what IT Guy meant with video transfer. How sweet?! All I need to do is send all my files (photos, videos, films and other materials) and they will convert them into digital formats and then will send them back to us with the original materials. As easy as that! Of course some may opt to do it themselves but then I'd say I already did enough making our own memories. I will do my share in the making of my memoir recalling all events, places and people. I will leave the documentation part to professionals. At least that is how the IT Guy convinced me! Ha ha! So this morning I was able to sort out some nice photos of me with Alvin Patrimonio...so so fun to see how I was 15 years ago! Some tales worth telling another time. One of the things that occupies my mind while I'm here in Manila is moving to a new place. While most of my friends have been moving around, some even tried coast to coast movement in the US I've never tired moving to a new place in my life. So today I tried searching for some moving tips. I found Moving Companies Los Angeles, a site which offers all help once needs to move to a new location. Important documents and possessions, such as wills, deeds, jewelry, photographs and home videos are impossible to replace. It's wise to consider moving these and other important belongings to a safety deposit box while you move. Remember to contact your local post office and fill-out forwarding address forms. Additionally, leaving a small welcome card with your forwarding address for the people moving into your old home is a nice way of asking for any additional pieces of your mail to be redirected. Do not have your phone disconnected until after loading day. DON'T polish your furniture! This makes the furniture slippery for the movers or yourself, also when we wrap pads around the furniture it can leave marks on the furniture where the pad was placed, do to buildup of cleaning residue! Reserve ample parking for the truck. If parking is to be on a city street, it is your obligation to tell the movers of any meters that need to be capped by the city. In the winter, be sure to have the parking area and walkways clear of snow and ice. Prepare an "Unload First" carton with essentials that you'll need immediately at your new home (Essential Items). Include a bag filled with hardware from disassembled items, such as dresser mirrors and beds. Try to keep boxes to 50 pounds or less and always lift with your legs. Tape the bottom of all boxes to make certain they will hold your belongings. Pack books flat, not standing on end (which may cause damage to the spines). Books are extremely heavy, so don't pack too many in one box. For more information, please call Los Angeles Office Movers. 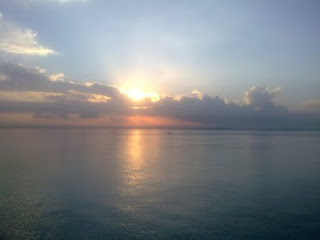 This picture was taken early this week on a boat to my Grandma's place in Bohol island. I just couldn't help but take a picture of the beautiful sunrise. Even with the typhoon up north in Luzon the weather in the Visayas region was just surprisingly good and the seas calm. Two months ago, the IT Guy got my a swimwear, a hydra suit to be specific. I have to say it feels so good in the water for whatever reason. It's so sporty and exactly what I need to go back to the pool and to take swimming seriously again. Early this year my doctor told me to go back to swimming as an alternative to going to the gym since I told him I've had not time to exercise the way I used to. He told me swimming can be very good for my body and it can help me manage body pains and stress aside from my weekly massage. Let's make it short I started using my new swimwear and my friend just LOVE it, that she told me all she want for Christmas is a swimwear. Okay! But then we're not the same size. Thank goodness online stores for womens swimwear. I found her a nice, cute swimwear for her size. I just placed an order and hopefully it gets here on time for the Holidays.